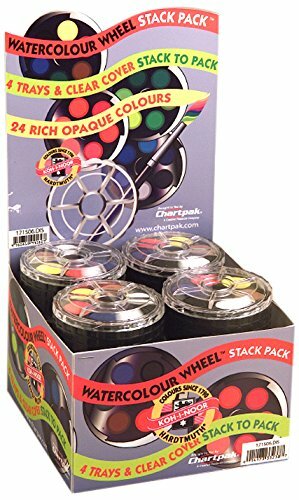 The Koh-I-Noor Opaque Watercolor Paint Wheel is a paint set in four interlocking, stackable trays. It features 24 rich, opaque colors with each paint color measuring 7/8" diameter. Use the clear plastic cover as water tray. Interlocking trays allow paints to be safely transported to any location. Made in Czech Republic. Koh-I-Noor - bringing you the best in professional grade drawing and design. Display of 16.